Thank you for your interest in our technology! Here are answers to the most frequent questions we get. Don’t see yours listed? Email sales@allpowerlabs.com. Access to appropriate feedstock is the first and most important consideration that will determine whether or not the Power Pallet is right for your application. For a detailed list of suitable feedstocks, please see this feedstocks page. Our gasifier requires wood-like biomass such as wood chips and tree nut shells (including coconut). The moisture content must be less than 30%. Drier feedstock performs better. 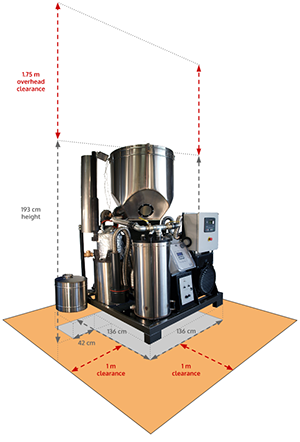 The pieces must be larger than 1 cm, but smaller than 4 cm (Screens are included to sift feedstock). Using an unapproved feedstock will void the warranty. The following feedstocks will not work with the Power Pallet. Our machine currently converts about 5% of the feedstock into char-ash, which is usable as biochar soil amendment. The machine is not designed primarily for biochar production; this biochar is only a byproduct of gas production. The Power Pallet has a minimum required load of 3kW to keep the reactor hot enough to produce clean gas, and a maximum capacity of 15 kW at 50 hz, and 18 kW at 60 hz. If you have an individual load that exceeds the capacity of the Power Pallet, it is possible to synchronize multiple Power Pallets together using our grid-tie module to form a microgrid with greater capacity. The Power Pallet is intended to operate in sessions that are 12-15 hours long. It is not designed to run 24 hours a day, seven days a week. The most common maintenance items are emptying the char-ash canister, the cyclone soot canister, and draining the condensate vessel. These are done daily. In general, the maintenance and repair required for the complex gasifier system will be in addition to whatever maintenance would normally be required on a fossil-fuel-powered genset. Also due to the nature of the syngas, maintenance on the genset’s engine will be somewhat higher than on a comparable fossil-fuel genset. For additional information about maintenance items, see the maintenance section in our Operator’s Manual. If you are interested in purchasing a Power Pallet, we can prepare a price quote for you. Each unit is custom made to our customers specifics in our Berkeley facility. Please contact sales@allpowerlabs.com. The terms of payment— 50% downpayment, 50% before delivery. We ship door-to-port, according to incoterms EXW (ex-works). The lead time is 120 days from the date of downpayment. If you would like a shipping estimate, please email us and let us know what port at which you would like to receive the shipment, and we will obtain an estimate. But please note that the price of shipping often changes between the time of ordering and the time the item is ready to deliver. Grid Tie option— the grid tie electronics let you synchronize several grid-tie models together to form a microgrid with a combined capacity greater than that of a single PP20, or to feed electricity back onto the grid to take advantage of feed-in tariffs, if they’re available to you. This option is recommended if you are not able to split your load into independent circuits, and require a single power source that can drive a greater load. Continuous feed hopper lid— at sustained high loads, the PP20’s hopper will need to be refilled too frequently to be cost effective as a manual task. The level sensors that come with this accessory detect low feedstock conditions and activate a farm conveyor (which you will need to provide) and open the hopper lid for loading. As soon as the feedstock level is high enough, the hopper lid and conveyor are deactivated. CHP accessory—the combined heat and power accessory recovers up to approximately 20kW of thermal energy from the hot radiator fluid of the engine, in proportion with the load that is being driven. This module produces hot water. If you have any additional questions, please email me, and I will do my best to answer your questions. 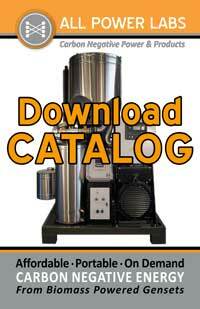 Interested in learning more about ALL Power Labs gasification systems? Come to our open house, the second Friday of each month. Electric Vehicles eat for FREE! Bring yours and we’ll feed it electricity produced sustainably from wood chips and nut shells.